I am sitting at dinner at Brand Steakhouse in the Montecarlo over the weekend with Mike Whitfield talking about workouts while enjoying our chocolate custard dessert. Like Mike, I am a huge dessert fan, and what happens in Vegas stays in Vegas, right? What is even more impressive though is that he lost 105 pounds while doing ZERO cardio! ==> See Mike’s Unique Method <————-Backed by research and RESULTS! That about sums up Mike. In all honesty, Mike is a huge mentor of mine even though I have only known him for a few months. He’s always there to lend a helping hand. That said, Mike’s got an incredible sale happening right now on the workouts that allowed him and hundreds of his clients to lose hundreds of pounds. These are something I use everyday in my own workouts simply because they allow you to double or triple fat loss at the end of your workouts. And the best part is, these can be easily placed into any workout program. You don’t have to stop your current routine or switch to something new. Just pick a workout, place it at the end of your current routine, and you are good to go. And here’s the best part, today Mike is adding in an AWESOME bonus so if you head over there before the end of tonight you will receive all 51 finisher workouts plus 21-minute metabolic blasters! Simply order Mikes amazing workout finishers program through the link below, send your receipt to dennis (at) fatburningnation (dot) com and I will send you over your FREE bonuses! 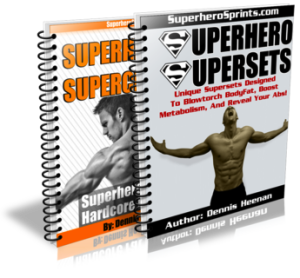 ==> 51 Finishers, 21-Minute Metabolic Boosters PLUS Superhero Supersets PLUS Superhero Supercharged <== Fast Action Bonus Ends Tonight!